One of the few things of which we can be certain is that one day, we’ll die. For many of us, this is something we avoid thinking about, preferring to concentrate instead on getting through each day in as positive and as present a way as possible. But imagine how our anticipation of this final journey might change if we could choose to be sung to, as we passed out of this life. This is the mission of Ilana Sharp. Ilana leads Sonder, a women’s singing group that has been meeting monthly since March at McCulloch House, a palliative care centre that’s part of Monash Health in Melbourne, to sing for people who are reaching the end of their life. Singing acapella in three and occasionally four-part harmony and for up to forty minutes each time, this group of eleven women are bound by their desire to deliver an uplifting sense of joy into an emotionally complex environment. Unsurprisingly, Ilana finds it’s an amazing thing to do. Sonder sing for the benefit of everyone in the hospice. For the patients, the staff, for themselves and for the family members of those people who are dying. Ilana says this isn’t without challenge and that life continues around them from their central point in the lounge area between the two wards. “Phones ring, sometimes the TV’s on….” But the staff assure them that the sound of their singing transcends this, travelling down along the corridors and filling all the rooms. Then about a year ago, the regular community choir to which all of the Sonder singers also belong, was having a night off. Keen to get their regular singing fix, some of the women met in the lounge room at somebody’s house. Used to singing together as part of a much larger group, the sound that evening was amazing; intense and enveloping, and the idea of singing as therapy for the dying recurred to Ilana. She put the idea out there, expecting for only one or two people to be interested but, to her amazement, the women agreed unanimously and Sonder was born. It was never Ilana’s intention to start a singing group of her own, and the emergence and sustainability of leading a group under any conditions, is rarely without challenge. At first, Ilana felt a fraud. The dynamics were messy, things felt disjointed within the group even though they were united by a common aim as everyone struggled to work out a structure. Recognising the need for someone to take a stand and emerge as a clear leader, and with support from within the singing circle, Ilana found the courage to seize the reins and offer direction, something she has continued to do, taking cues on instruction where she can and attending leadership skill days. She’s surprised to find how much of what is required is already in her. Sourcing material is a collective process with everyone suggesting and contributing songs. The women then work out harmonies and commit to meeting and practicing two or three times a month. This in itself is a challenge because of the pressures of life, such as work and kids and other bumps in the road. This aim of their singing is not to make the world stop and listen, but to deliver a sense of warmth and light, and the women in Sonder find that they get out as much out of doing it, as the people on the receiving end of their singing. This summarises the mission of the singing group perfectly. Singing to contribute a sense of normalcy and peace to the fabric of an emotionally charged environment and at the crossing points of the lives of many people, in as unobtrusive way as possible. To be the light in the window. If you know of the Sydney based singing group from which Ilana’s inspiration came, or of the existence of other Victoria based groups doing a similar thing to Sonder, do get in touch. Ilana would love to hear from you, and so would we. 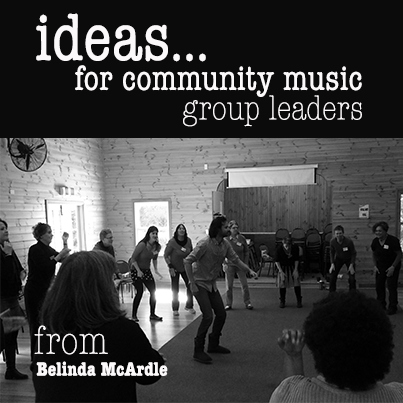 Several community music makers and group leaders gathered at Commonground for peer exchange last weekend. I arrived late and left early and am in no position to summarise the weekend but I write to contribute to the network the ideas that captured my attention while there, in the hope they may be useful to others. Having facilitated many CMVic weekends over the last ten years it was refreshing to be a participant and to be so warmly welcomed, encouraged, supported, inspired, challenged and heard. It was wonderful to step away from my own busy life to engage in the wider discussion of values and music making even if only for 5 hours. I left with soup in my being, songs recorded on my phone, a copy of Jane Coker’s fabulous new resource ‘Just Sing’, some plans to song swap on line, fabulous group exercises and warm ups and some hearty food for thought. The afternoon workshop, mutually devised and well facilitated by Strat and Aaron, challenged us to check in with our values and the notion of inclusivity. Various exercises drew out philosophical arguments, practical tips and everything in between. I summarise here what I remember, having handed in my notes to CMVic. The topic was what can we as music making leaders/an organisation keep doing, stop doing and start doing in relation to inclusivity. ensure I feel included by sharing with the group that I would prefer not to leave alone in the dark at nights and ask them to share staying back with me. I used to ask participants to bring their instrument on last week of term and then run 3 chord song so it was accessible and interesting in a different way. I need to start that again. Use the microphone in Facebook Messenger to send little voice files to other leaders and receive them back. Contribute more to the blog/wider discussion so I can hear what others are doing and be reminded of our very important differences that keep us interesting.